Auxiliary (or special) historical disciplines has always played an important role in the training and professional work of historians. This is due to the fact that auxiliary historical disciplines provide researchers with the necessary tools for criticism and interpretation of sources. Nowadays these disciplines are increasingly perceived not as auxiliary to historical science in general, but as an independent and self-sufficient interdisciplinary field of research. Research in the field of auxiliary historical disciplines can greatly assist in the development of inter- and trans-disciplinary approaches and methods in the framework of the humanities in general, and in the development of research at the intersection of the humanities and other sciences. In turn, the improvement of methods of interdisciplinary cooperation will significantly increase the efficiency of scientific research in the field of humanities and in science in general, thanks to the integrative nature of the current stage of scientific knowledge. 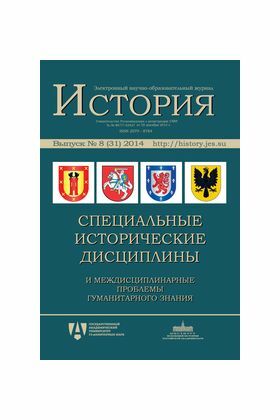 This volume presents papers prepared mainly by the scientific workers of the Institute of World History Russian Academy of Science. The papers show a wide problem and chronological repertoire, as well as a variety of research approaches and practices in a number of special historical disciplines — paleography, codicology, historical geography, prosopography, heraldry, vexillology and source studies.